I have often said that weight loss is a lot more complicated than simply “eating less and exercising more”. New research indicates how much more complicated weight gain is due to circadian rhythms. Our brain and virtually all of our cells are programmed to run on a 24-hour cycle to help us optimize future events (like sleep and eating) that are essential for life. In fact, even fungi have these biological clocks. There is a central clock in the brain that responds to light and dark by releasing the hormone melatonin. Melatonin, as well as other hormones, prepares the individual cells in different organs for an anticipated stimulus that allows those organs to rapidly respond with the greatest efficiency. The adipose tissue is one of those organs. This is why the uptake and release of fatty acids by the adipose tissue has a strong circadian rhythm (1). One hormone that is exclusively released by the fat cells is leptin. Both leptin and ghrelin (the hunger hormone released from the gut) are also under circadian control (2). The bottom line is that as our light/dark cycles are becoming more distorted, the hormones that affect our appetite are also being adversely affected. It is known that sleep-deprived individuals are more inflamed (3) as well as have abnormalities in glucose metabolism (4). New research indicates that increased light during the normal sleeping cycle for mice increases their weight and their fat mass (5). Most disturbing is that you only need a very dim light on during their normal sleep cycle to increase weight gain in the animals. 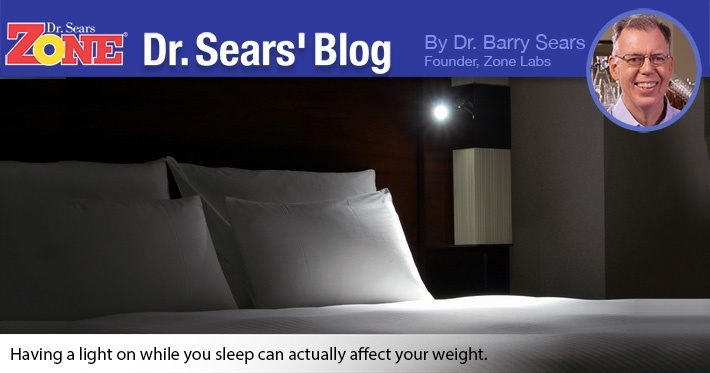 The more intense the light during their normal sleep cycle, the greater the weight gain. This is also true for humans, as discussed in an online pre-publication release that will be published in the March 2011 issue of the Journal of Endocrinology and Metabolism (6). In this study, subjects were exposed to dim lighting (about one-half the intensity of a typical office light) for eight hours prior to bedtime; then the release of melatonin would be completely suppressed for about 90 minutes after they started sleeping. Just like the mice, if the light was on, even dimly, while they were sleeping, their melatonin levels were depressed by about 50 percent. The less melatonin you release during sleep, the more body fat you accumulate. Bray MS and Young ME. “Circadian rhythms in the development of obesity: potential role for the circadian clock within the adipocyte.” Obesity Rev 8: 169-181 (2006). Karla SP, Bagnasco M, Otukonyong EE, Dube MG, and Kalra PS. Rhythmic, reciprocal ghrelin and leptin signaling: new insight in the development of obesity.” Regulatory Peptides 111: 1-11 (2003). Vgontzas AN, Papanicolaou DA, Bixler EO, Kales A, Tyson K, and Chrousos GP. “Elevation of plasma cytokines in disorders of excessive daytime sleepiness.” J Clin Endocrinol Metab 82: 1313-1316 (1997). Spiegel K, Leproult R, and Van Cauter E. “Impact of sleep debt on metabolic and endocrine function.” Lancet 354: 1435-1439 (1999). Fonken LK, Workman, JL, Walton JC, Weil ZM, Morris JS, Haim A, and Nelson RJ. “Light at night increases body mass by shifting the time of food intake.” Proc Natl Acad Sci USA 107: 18664-18669 (2010). Gooley JJ, Chamberlain K, Smith KA, Shalsa SBS, Rajaatnam SMW, van Reen E, Zeitzer JM, Czeisler CA, and Lockley SW. “Exposure to room light before bedtime suppresses melatonin onset and shortens melatonin duration in humans.” J Clin Endocrino Metabol doi:10.1210/jc.2010-2098.